Appliance Service Orders, Appliance Repair Orders, Appliance Maintenance Invoice, Appliance Repair Receipt Forms, Appliance Repair Service Orders, Appliance Service Orders, General Repair Forms, Estimates of Repair, Proposals. 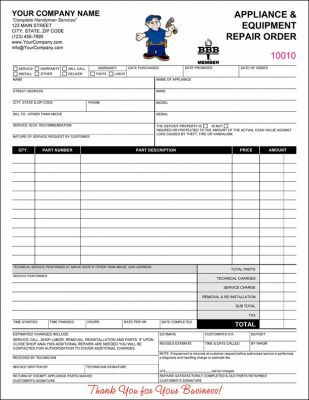 Appliance Repair Forms are customizable and can be personalized by adding your company information. Small Engines. 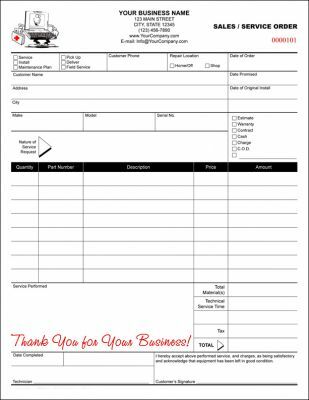 Multi use, fillable, Service and Repair form for inhouse/store or home/office service calls. A very good form for all types of sales, repair or maintenance plan, for inhouse or field work. Great for repairmen, technicians and other specialists. All the information regarding the job can easily be listed and complied without any useless complications, checkboxes makes fill-in a breeze. The smooth working is bound to create a great impression on your client who will remember you clearly by the name and address of you company that you can place on your own, personalized form. Can be customized and personalized with your business name, address and business logo and start using the fillable form right away with free Adobe Reader which is a self calculating form or Microsoft Word, use as digital or manual data entry. 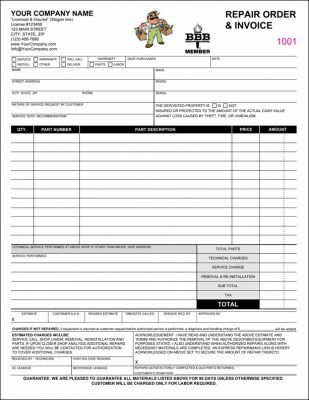 Multi use, fillable form used by all type of repairmen and technicians alike and can be used with many trades, appliances, HVAC, electronic repair, kitchen appliance, computer service & repair, small engine repair and more! Very flexible to customize to meet your individual repair and service needs. 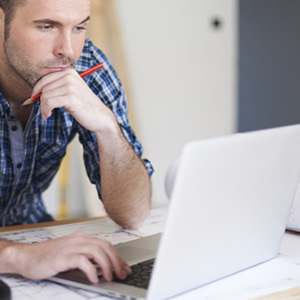 Repair and service order form eliminates extra write-ups for invoicing! One write-up does it all! Features checkboxes simplifying write-ups fast and easy. May be used as a repair, service, installation and warranty service form.